We all dream of great relationships, finding fulfillment in our homes, and lasting success at work, but too often we end up putting our dreams on a shelf. How can we blow out of this reality and discover the life we’re meant for? Bil Cornelius, pastor of Bay Area Fellowship, one of the fastest growing churches in America, has helped thousands of people look clearly at their challenges and take positive steps to new life. In I Dare You to Change! you’ll find a bold, motivational manual to get started—today! Through the example of the way God transformed Gideon from a quiet wheat thresher to a fearless champion for the Israelites, you’ll start putting to work God’s timeless principles for how to break your cycles of failure, discover your calling and go big, adopt a new attitude, develop a plan and a team, act decisively, and sustain success. 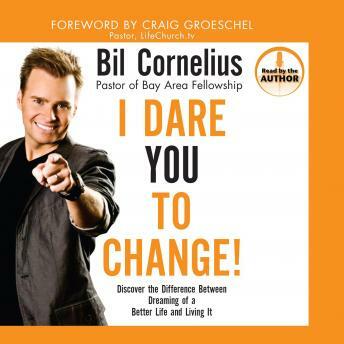 With Bil Cornelius and I Dare You to Change! you’ll be encouraged, inspired, and empowered to move your life in the new directions God has in store.